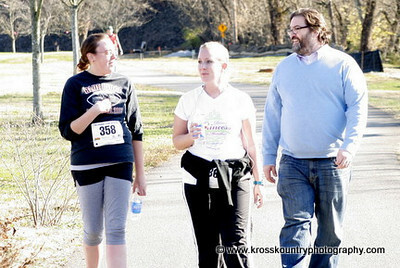 A unique and very imaginative run on the KTC schedule, it's a combination of several neat things into a very fun event: low cost - $5 - proceeds donated to the News-Sentinel's Empty Stocking Fund (those who choose not to run can still donate through this event), the clock is set up but the run is untimed (no results per se), all leftover race shirts are free for the taking with no limit, and the KTC gives a surplus award to every participant who completes the run (I got a 2nd place age group from the EXPO 10,000). For me the worst thing was I parked at the wrong end of Tyson Park, and missed the start of the race when I went back to my truck to get my camera & stow my goodie bag. The clock was showing about 3:35 or so when I started. It was about 33:10 or maybe a tad more when I finished (coupled with three trips to the far end of Tyson Park I probably logged pretty close to 4 miles - thanks to David Simpson for a ride afterwards, sparing me a FOURTH long walk) and I think I surprised at least a few people by running, only using the camera for a few post-race candids. I didn't recognize the overall male winner (and no results so I can't use them as I usually would), but Sarah Crowley was 1st female.